Once upon a time, a long time ago, there lived a great warrior. 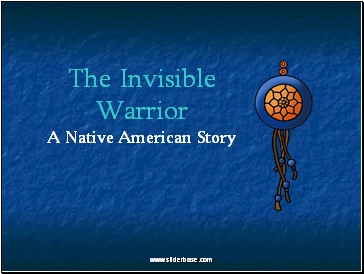 The people told many stories about this strange and wondrous warrior. One story told of his great power of invisibility. That meant he could wander among the enemies of the tribe, and hear all of their war plans! Another story told of his great loneliness. 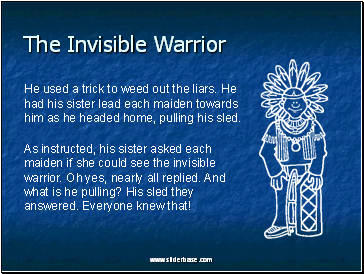 The only person who could see the invisible warrior was his sister. As much as he loved her, he longed for a wife. 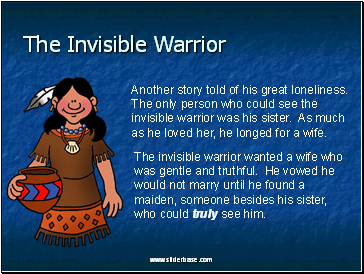 The invisible warrior wanted a wife who was gentle and truthful. He vowed he would not marry until he found a maiden, someone besides his sister, who could truly see him. He used a trick to weed out the liars. He had his sister lead each maiden towards him as he headed home, pulling his sled. 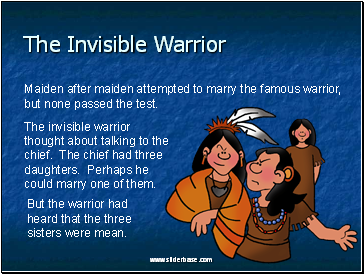 As instructed, his sister asked each maiden if she could see the invisible warrior. Oh yes, nearly all replied. And what is he pulling? His sled they answered. Everyone knew that! How is the sled tied she would ask? Here the answers varied. One said with strong rope. Another said with strong vines. Still another said with strong leather. 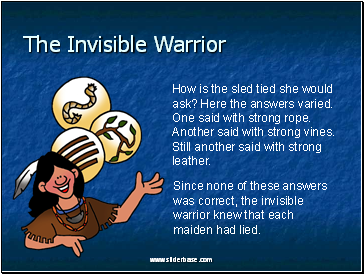 Since none of these answers was correct, the invisible warrior knew that each maiden had lied. Maiden after maiden attempted to marry the famous warrior, but none passed the test. 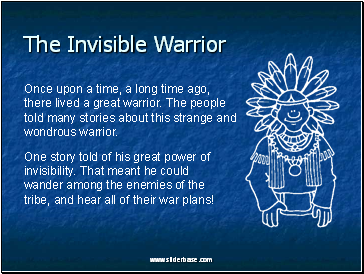 The invisible warrior thought about talking to the chief. The chief had three daughters. Perhaps he could marry one of them. But the warrior had heard that the three sisters were mean. 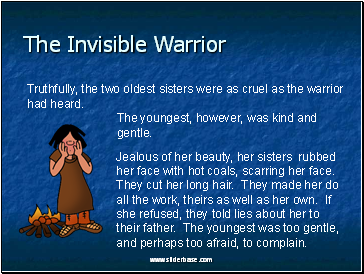 Truthfully, the two oldest sisters were as cruel as the warrior had heard. The youngest, however, was kind and gentle. Jealous of her beauty, her sisters rubbed her face with hot coals, scarring her face. They cut her long hair. They made her do all the work, theirs as well as her own. If she refused, they told lies about her to their father. The youngest was too gentle, and perhaps too afraid, to complain.